Related Post : How to Crack JEE Advanced in 12 Months? I had no proper coaching in 11th and 12th. Just regular tuitions. And when I sat for JEE Main 2013, I knew I hadn’t prepared enough, but the real shock came to me when I saw my marks. I had secured 123/360 in MAIN (63000 rank), barely clearing the cutoff for JEE Advanced. Considered to be an intelligent student by my parents, classmates, teachers, relatives, this was one of the most painful and embarrassing moment of my life. I knew I won’t get a good government college, since i hadn’t scored well enough in boards(90.6%) as well, and also being from a general category. Although I cleared the cut off for JEE Advanced (113 for general), I knew it wasn’t my cup of tea. Still, I gave the JEE Advanced. Got 92 marks out of 360. Not even clearing the basic 35% cut off (couldn’t even clear the 10% cutoff for maths!). Go for a private college. A reputed coaching centre had setup its new branch in my city, and so it was conducting its entrance exam for droppers program. I knew getting into it would mean a straight 1 lakh Rupee expense, so this entrance exam had to go well. I gave it. Got a decent rank, so I asked my father to enroll me in the coaching. Now since I had a good discount on tuition fee, it was easy for him to get me enrolled. The institute covered up the basic flaw in my studies. It had a systematic approach. The teachers were really good. And they made me give a lot of tests and focused on improving and strengthening my concepts. Then in November I joined a test series which used to conduct tests for JEE Main and Advanced every week. Students who were preparing since 11th class were also there and they used to get a much higher rank than me in the test series. However as the time passed by, I soon caught up to them, and my performance improved, however they were still ahead of me. Then in March, the entire syllabus and course ended and I had a month’s time to prepare for JEE Main. But this time I had something valuable. I had the entire month for preparation whereas they were busy with their board exams. Still, since I am not someone who would study on his own for hours, the lack of teachers focusing on me made me lazy. I studied roughly 3-4 hours a day. Then the judgement day came. JEE Main 2014! While I was going to the examination centre, I was having a bad feeling about it. I knew I had prepared well but still I was lacking confidence. I gave the paper. And much to my disappointment, scored less than I should have or I expected myself to. I had secured 212 marks this time. Though it was better than last time but still wasn’t worth the one year devoted. With this and my board marks, I would barely manage a core branch in some NIT. Thankfully, one day I visited a friend of mine (who got selected into the IIT in 2013). Meeting him and learning his experience of IIT, both reminded me of my humiliation last year and the reason I dropped. After that I just looked forward to JEE Advanced, practiced questions 3-4 hours a day and read theory thoroughly. Gave the test series. And finally on the day of JEE Advanced, I went in like I had nothing to lose. Although the sight of so many students around you, discussing questions, etc etc, tried to make me nervous, I kept myself calm. After the exam, I felt relaxed. Although still unsure of my performance, I felt as if a weight had been lifted off my head. I said to myself, this is the best I can do, and I did it. Then after relaxing for few days, I saw the official answer sheets. I double checked if I had by mistake marked an answer wrongly. Nope! All were the same ones I had marked in my question paper. Then I saw the official ans key and calculated my marks. I had secured 206/360! I knew I had made it. But still kept my cool. The day of the results came and the website was causing a lot of trouble. I texted a friend of mine my Roll No and DOB to check for my rank. He texted me back, “It’s 2027”. I told my mother, “Mummy mera rank do hazaar sattaiyis hai (Mummy, my rank is 2027)!”. Then she had that big smile on her face. My father is a strict person. He didn’t smile at first and said, “Last year tumhare friend ka isse better tha (Last year, your friend had secured better rank than you)”. I knew he was happy from within but didn’t want to express. 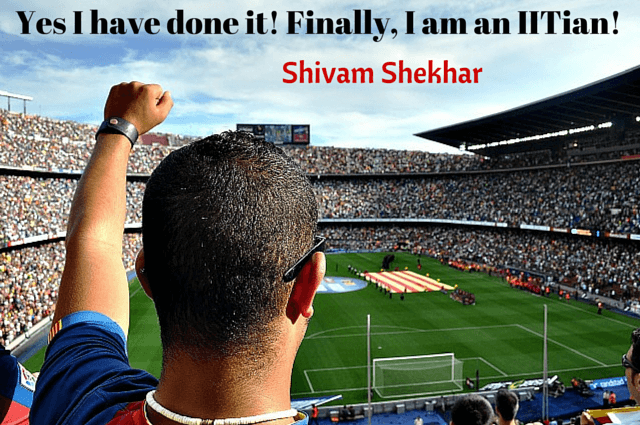 Shivam Shekhar is an Electronics Engineering student at IIT (BHU) Varanasi. He is a programming enthusiast, an anime freak and a knowledge seeker.